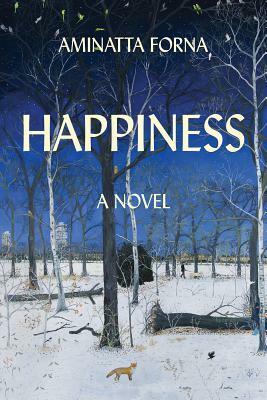 I downloaded Happiness from Netgalley because Annie (from A Bookish Type) loved it so much back in February. It even made it to #1 of her favorite books of the first part of the year. Her review was so glowing that I jumped on the ARC. To be honest, I wouldn’t have thought to choose this book because the title is so lame. It was not love at first sight. It took me a while to grow into it, because it’s a meandering book with many people and many stories, but like happy fairy tales, in the end, they lived happily ev… oops, I should say, I really, really liked it. I liked it because it’s one-of-a-kind. I liked it because it’s a book free of clichés, and full of great characters and great ideas. The female main character is Jean, an American middle-aged, divorced biologist, who currently lives in London to study foxes who have adapted to urban environment. The male main character is Attila, a psychiatrist from Accra, who has worked for decades to treat civilians traumatized by war and who is in London for a few days to deliver a keynotes speech at a conference. Their meeting is a long shot. Their becoming friends is unlikely. Their falling in love is nothing short of a miracle. Jean and Attila have lived through a number of catastrophes, big and small. They have grown and evolved and learnt some truths. They are good people, but they aren’t perfect. The book is about connections, common humanity in face of loss, death and life events. It goes against the grain when it speaks about tragedies and death as normal parts of life. Attila teaches (it feels a little preachy, at times, but the character is so wise that I’d listen to his lectures anytime) that Western people have pushed death out of their lives so much so that people stricken with loss and grief are treated as pariahs. On the contrary, people from other parts of the world acknowledge that life is fragile, don’t expect things to go well all the time and close rank around the bereaved. It surely is an idealistic view of non-Western people (as my recent reading about Indian slums has shown), but it’s also a refreshing reminder when picture-perfect images of happiness ever after are pervasive on the (mostly Western) internet (or else, you’re doing something wrong and here’s the 10 steps). Besides Jean and Attila there are many secondary characters that I loved in the book: a community of immigrant street cleaners, hotel staff and street performers who live in the city but aren’t seen and acknowledged. They help Jean to record fox sightings across town, and will help Attila when the need arises. The book makes you feel rather hopeful in humanity, and that’s a rare treat these days. I hadn’t heard of Aminatta Forna before and I’m glad of this serendipitous discovery (thanks Annie!). I’ll be definitely checking her other books out. I’m so glad you took a chance and liked it! I’ve been evangelizing for this book ever since I read it. I hope to evangelize to a few more people! Thanks for the recommendation!! I have a friend who is every bit as evangelical about this book, but she has chosen it as her selection for our book group and her turn doesn’t come up until the new year so I am putting it off until then. Something to look forward to next year!